Alternate nostril breathing, also known as nadi shodhanam or “channel purification,” is a preparatory breathing practice to pranayama and is one of the most powerful initial yoga exercises for centering your attention and deepening relaxation. Because the exercise alternately stimulates the contralateral cerebral hemispheres, it balances the influences of both hemispheres, enhances the communication between the hemispheres across the corpus callosum, which connects them, and over a long period of practice, it substantially moderates emotional reactivity. In pranic terms it purifies the nadis or energy channels of the pranamaya-kosha in the subtle body and affects the limbic system, the emotional body in a positive way. The exercise is usually performed after asanas and relaxation and just prior to meditation. Also before meals on an empty stomach. Or any time one wants to calm and center oneself. The usual recommendation is that you practice three rounds, alternating the starting nostril each time for a total of 36 alternating nostril breaths and 18 both nostril breaths. It takes 5-10 minutes to complete. 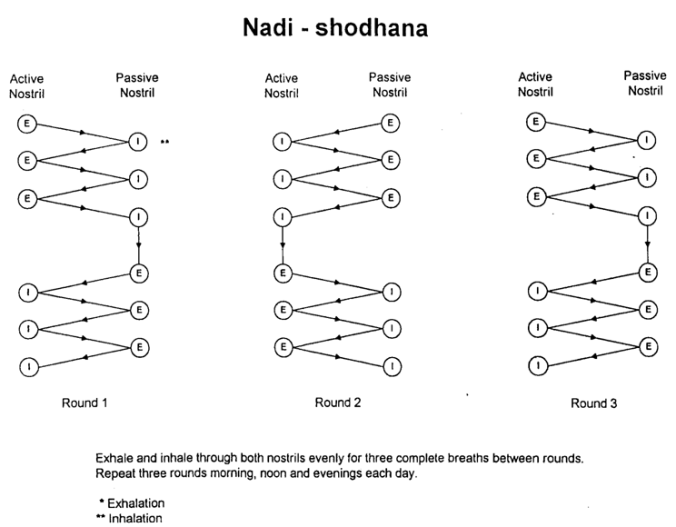 The first round begins by exhaling through the active nostril, the second round begins by exhaling through the passive nostril, and the third round begins, again, by exhaling through the active nostril. Step 2: Practice, Practice, Practice! When this pattern is quite familiar and natural to you, feel free to continue the pattern and complete three sets of three rounds (108 breaths). It takes between 30 and 45 minutes to complete and is a very good way to quickly reach a state of very profound mental and physical stillness. As your concentration improves, try changing the flow of breath mentally. Step 4: Repeat Another 2 Rounds, refer to chart above. After completing the above 12 breaths continue with 6 breaths from both nostrils (exhale + inhale x 3). This represents one round of the exercise (12 alternating nostril breaths + 6 both nostril breaths).